Vegetarians and Iron Deficiency - Is It Worth The Risk? Home foods Vegetarians and Iron Deficiency – Is It Worth The Risk? Being vegetarian is a personal choice. Some avoid meat because of moral reasons, some avoid it because of potential health issues and some simply avoid it because they have heard that meat is bad. Eating lots of meat every day might be harmful, but eating considerate amounts per day has not been proven to be unhealthy. It is really difficult to study the effects of food on long-term health and there probably won’t ever be a definitive answer to whether eating meat is bad or not. There is just too many other factors than food when it comes to overall health over the years to give an exact answer . On the contrary, meat contains lots of iron (red meat contains it the most) and iron is essential to life so eating meat in moderation should provide body with adequate iron. Most iron in human body is incorporated in hemoglobin, which is needed for carrying of oxygen in blood, as well as in myoglobin that is found in all muscles. Every living cell contains iron and needs it for basic functioning. Iron can also be found in the liver, bone marrow and spleen. The truth is that many vegetarians are anemic, meaning they lack iron. The iron in meat is quite easy to absorb whereas that in veggies is less so. In addition, some of the vegetarian foods even make this absorption more ineffectual. For instance, soy products can make iron less absorbed. It is figured by the WHO (World Health Organization) that inadequate amounts of iron in the blood is the number one nutritional problem in the world reaching statistics of 80 per cent of the world population! Many medical experts and dietitians believe that there is iron deficiency in vegetarians. In other words, the people who are vegetarians are at risks of developing iron deficiency. This could be because of less availability of essential iron present in vegetables. Meat is the prime source of iron that vegetarians do not eat and as a result of that, they might have suffer from such condition as believed by health care providers. The signs and symptoms of iron deficiency include general debility, paleness of the body, exhaustion and breathlessness (dyspnea). In more severe case, even death can occur. Iron deficiency can occur when the amounts of iron taken in body does not meet the demand of the body to function normally. 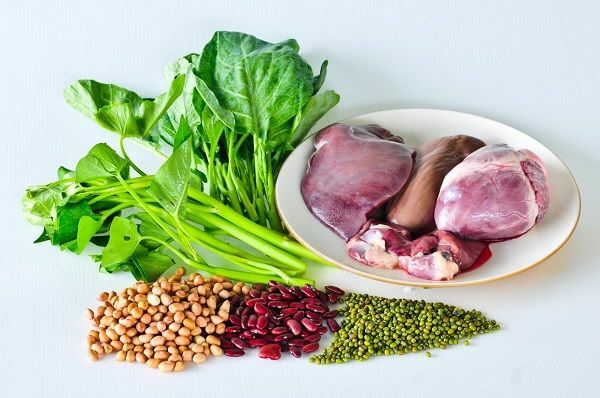 The process of iron deficiency is generally very sluggish since the body first tries to counterbalance for the instability by getting iron from other sources and storage within the body. Once the iron storage stock is eaten up, blood hemoglobin levels starts to drop and finally, it leads to iron deficiency anemia. According to one study, ferritin status found lower in vegetarian women as compared to omnivores. The vegetarian women did not report any substantial difference in the total iron intake in comparison to other women, but showed much lower haem iron. The report showed significantly decreased mean serum ferritin levels in the vegetarian women . Vegetarian diet can end up in increased capacity of iron absorption as a partial adjustment to lower iron bioavailability. This report was published by authors of an American feeding study. Further in iron deficiency in vegetarians, researchers found that vegetarian diet was linked with markedly less non-haem iron absorption as compared to non-vegetarian diet . In another study conducted in Thailand, it was found that there is a high level of iron deficiency in the people who are vegetarians. They also showed marked Vitamin B12 deficiency due to their vegetarian diet . Study was also conducted on strict vegetarian mothers and their infants in order to check out the link between iron deficiencies in vegetarians. The study showed that these people were at higher incidences and risk of anemia and iron deficiency . Indian Journal of Clinical Biochemistry Volume 9, Number 2 / December, 1994 by D. C. Sharma1 Contact Information, Raj Kiran, Vijaywantee Ramnath, Krishna Khushiani and P. P. Singh at Departments of Biochemistry and Gynaecology and Obstetrics, R.N.T. Medical College, Udaipur and Ddepartment of Biochemistry, S.M.S. Medical College, 302004 Jaipur, India.